PRO38B LED RC, PAR (Parabolic Aluminized Reflector) from ADJ (American DJ). American DJ has introduced two remote control LED color par cans, PRO38B LED RC and PRO64B LED RC, and two remote control LED color bars, Mega Bar 50RGB RC and Mega Bar LED RC, which can be operated from distances as far as 15'/4m away (direct line of sight). Each of the four fixtures comes packaged with a hand-held wireless infrared American DJ LED RC remote controller that gives users command over functions that would normally require a DMX controller or the operation of an onboard control panel by hand. The controller gives users remote access to features including selection of built-in programs, Auto Run (automatically running through all built-in programs), Strobe Effect, DMX Mode selection, Sound Active Mode selection, and controlling the speed of functions such as strobing and Auto Run. You can change colors via RGB mixing, change the DMX addressing, or even designate a fixture as a "slave" in a Master/Slave configuration - all from a distance of 15' (4m). PRO38B LED RC and PRO64B LED RC - A Par 38 and Par 64 black RGB LED par can respectively, both of these remote control fixtures offer a way to light up stages, dance floors and entertainment venues - "hands off" from anywhere in the room. 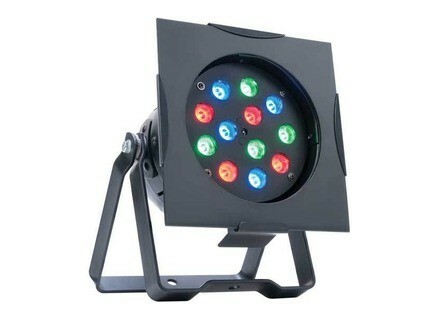 Featuring RGB color mixing with fast or slow color changes, built-in color macros, color strobing and 0-100% dimming, they can be operated in 6 modes: Manual Color Mode; Color Change Mode; Color Fade Mode; Auto (Program Run) Mode; Sound Active Mode; or DMX-512 Mode. Linkable via 3-pin XLR cable, their flexible dual bracket system allows them to be hung or set on the ground. 7.25"L x 7.25"W x 9.5"H/ 185 x 185 x 240mm and weighs 4 lbs./ 1.5 kg. The MSRP of the PRO38B LED RC, including the ADJ LED RC wireless infrared remote controller, is $199.95. PRO64B LED RC utilizes 24 x 1-watt 50,000-hour LEDs (6 red, 9 green, 9 blue), drawing 30W of power at maximum use. It features a wide 40° beam angle and an IEC AC outlet on the rear to daisy chain power. Dimensions are 10"L x 10"W x 15"H and weight is 8 lbs./ 3.7 kg. The MSRP of the PRO64B LED RC, including the ADJ LED RC wireless infrared remote controller, is $279.95. Mega Bar 50RGB RC and Mega Bar LED RC - These RGB-mixing remote control LED bars are a way to create color for stage, architectural wall washing and uplighting. Equipped with 100,000-hour rated LEDs they include a complement of features such as 0-100% dimming, built-in color macros and color strobe effect. They are linkable via 3-pin XLR cable and have an IEC AC outlet on the rear to daisy chain power. Mega Bar 50RGB RC is a compact 22-inch/ 0.5 meter LED lighting bar with 125 x 10mm LEDs (24 red, 54 green, 47 blue). It can be run in 7 operational modes Manual Color Mode; Color Change Mode; Color Fade Mode; Auto (Program Run) Mode; Sound Active Mode; RGB Manual Control Mode or DMX-512 Mode (7 different DMX channel modes). It has a 40° beam angle, draws 18W of power maximum, and weighs 3 lbs./ 1.5 kg. The MSRP of the Mega Bar 50RGB RC, including the ADJ LED RC wireless infrared remote controller, is $209.95. 2.75"W x 3.5"H/ 1025 x 65 x 88 mm and weighs 8 lbs./ 2.8 kg. The MSRP of the Mega Bar LED RC, including the ADJ LED RC wireless infrared remote controller, is $499.95. For more information, visit their website at www.americandj.com. 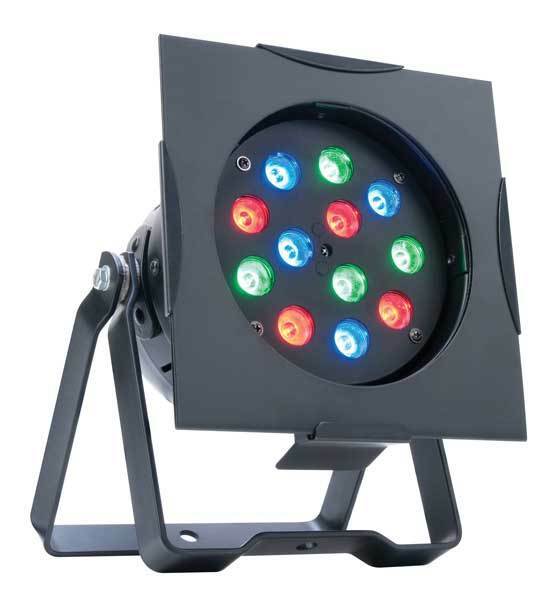 Elation ELED Tri Par 56 A 42-watt fixture, the new ELED Tri Par 56 has fourteen 3-watt RGB LEDs, (an equal number of green, red and blue). VMB Releases the TE-086 New Lift VMB has introduced a new lift to their pro series range.